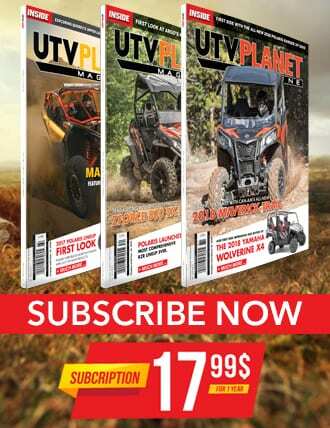 The UTV marketplace was nothing like it was just a few years ago. 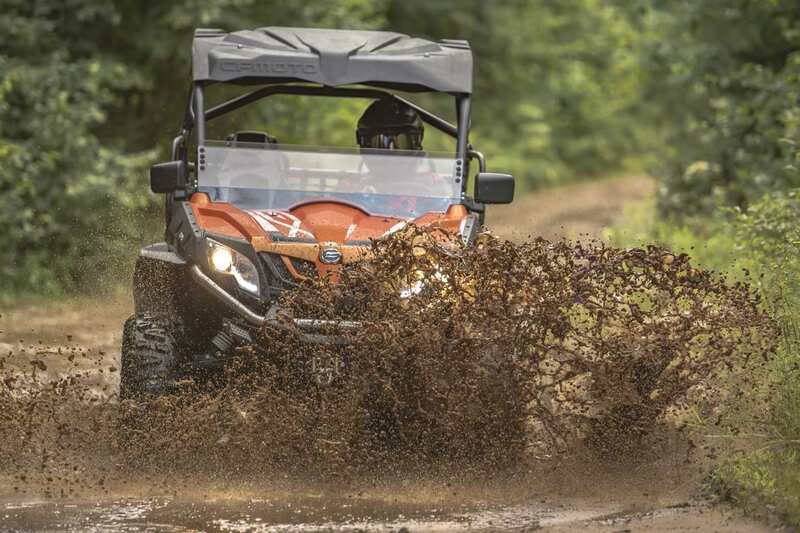 When the first sport-oriented UTVs hit the scene, it created a huge market for machines that offered up maximum fun for the money. The major North American and Japanese manufacturers jumped in and now CFMOTO brings a machine that offers up an amazing amount of fun for the money. 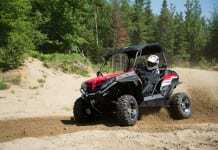 We were really impressed with the new ZFORCE 800 EX EPS and you will be too, if you check one out. One of the major things that people wonder about with CFMOTO is quality. 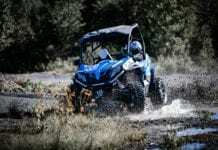 We know that some manufacturers have brought machines of questionable quality to the market in an effort to ride the coattails of the major brands. This is not the case as we’ve seen it with the ZFORCE. We have had no issues with our test units and have found them to be well built and a good buy for what they cost. One thing that stands out which we’ll get into with more detail, is the accessories that CFMOTO includes as standard equipment. Our unit had a roof, winch, mirrors and more. It also came with turn signals and a horn as standard equipment. Pretty cool stuff for the price. 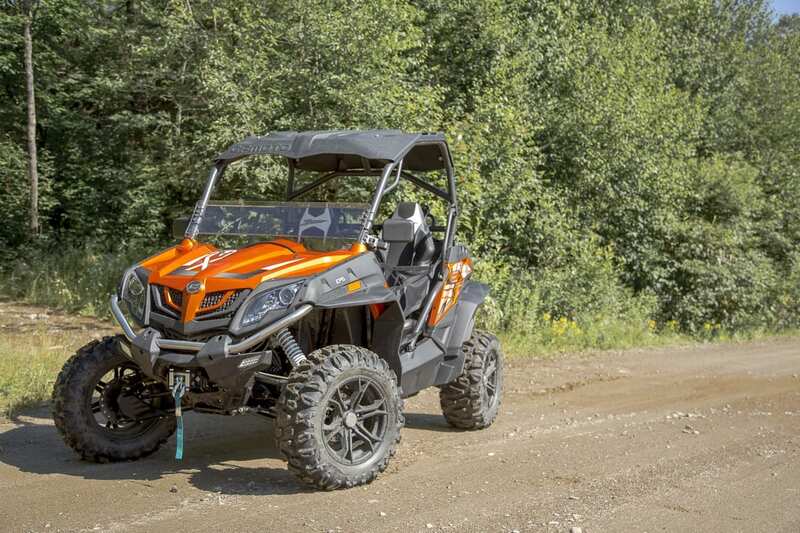 The ZFORCE has an 800cc V-twin four-stroke motor with eight valves and a bore and stroke of 91 x 61.5mm. This is good for 10.3:1 compression and 53ft/lbs of torque. This translates into 62 horsepower from a motor that hooks up well and hauls the mustard when you stomp on the gas. It’s a lot of fun to drive, too. The machine weighs in at 500kg dry and the curb weight isn’t bad. So when you’re on the gas, it feels sporty, light and responsive with a good mid-range hot and a decent top-end. Getting that power out is CFMOTO ’s CV-Tech IBC transmission that has a high and low range, with a parking lock shift system. 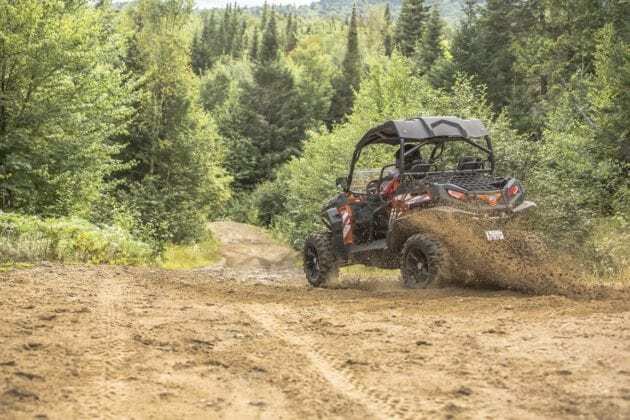 The machine has two- and four-wheel drive with an electronic locking differential for those times on the trail when it gets a little too hairy. We did not experience any lag from the transmission and shifting was crisp and firm. 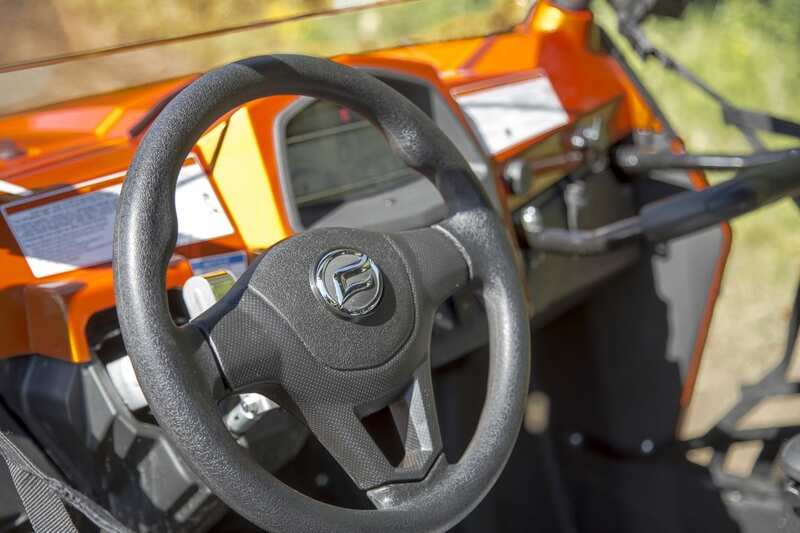 Steering gets a little stiff with the differential locked, but that is to be expected and is something we appreciate. The ZFORCE has really good suspension. Each corner has a double wishbone design with a gas shock that has separate adjusters for rebound and compression. This lets you really tailor the shocks and suspension action to your personal tastes. The front shocks have 283mm of travel and the rear has 280mm. For the price range of the machine, this system is really impressive. An integral part of the whole machine is the tires. 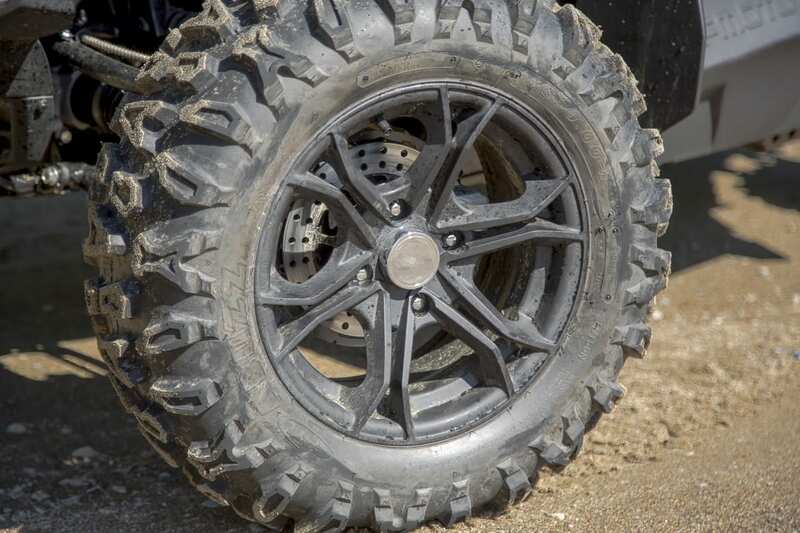 The ZFORCE rolls on 26-inch ABUZZ CST 6-ply tires on 14-inch aluminum wheels. These are a fairly aggressive trail tire and hooked up well across a wide range of terrain. We had ours in loamy dirt, rocks, sand and mud, all which were handled with ease by the tire combination. Being 6-ply, we were also happy to not have a single flat while on the trail. Nothing can ruin a good trail ride faster than a flat tire. Trust us, we know from experience. 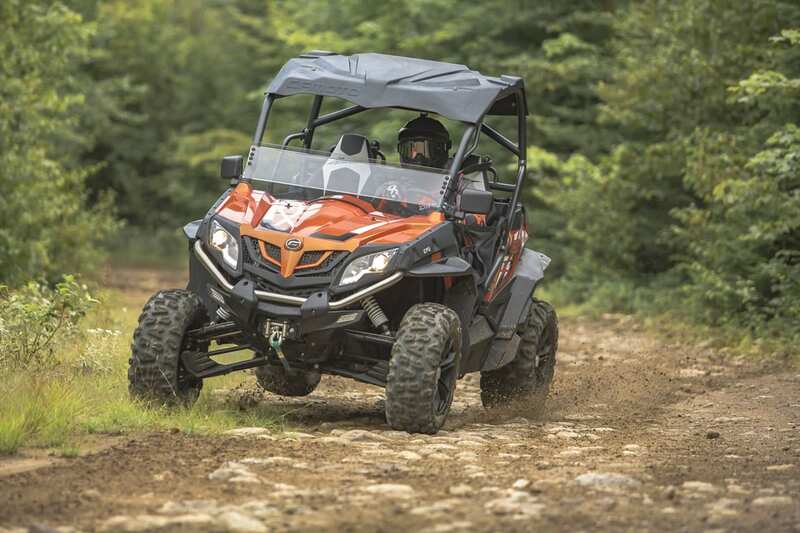 A good engine and suspension can be lost on a machine if it isn’t set up to handle. Luckily the ZFORCE handles really well. The overall dimensions are 2870 x 1510 x 1830mm so it’s right on par with other machines in the category. It has 300mm of ground clearance, too. This is important for not getting hung up on trail obstacles like rocks and stumps. That stuff isn’t any fun. Again, trust us; we know from experience. 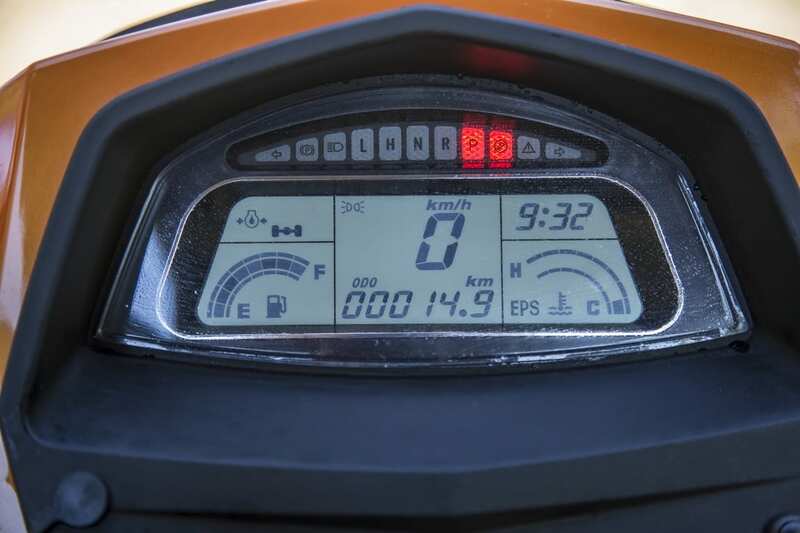 Steering responsiveness is quite well, with CFMOTO having added light power steering to the ZFORCE. Powering steering is something that can be a blessing and a curse. If it’s too light, you don’t feel like you’re in control of the machine as you lose that connection with the terrain. Too little power steering and the terrain can take over the handling of the machine and you again have an out-of-control feeling. 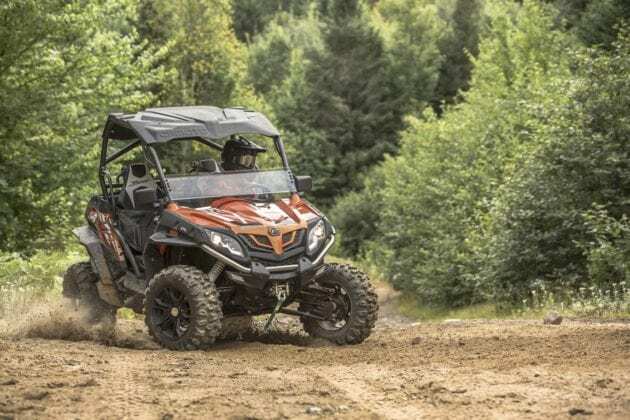 On the ZFORCE, the amount is right in the ballpark, with enough to give you confidence in the machine, but not so much that you feel like you’re playing a video game instead of driving a 62 horsepower UTV. Like we mentioned at the start of this review, the CFMOTO comes with additional features as standard equipment that other manufacturers only offer as accessories. It comes with sleek looking stainless-steel front and rear bumpers. It also has a 3,000lb winch with a remote control. This is a sweet feature for those times when you get into trouble. There are also nice A-arm guards and a full skid plate to protect the underbelly of the machine. It has side mirrors and a four-point seat belt system to go with the extremely comfortable seats. 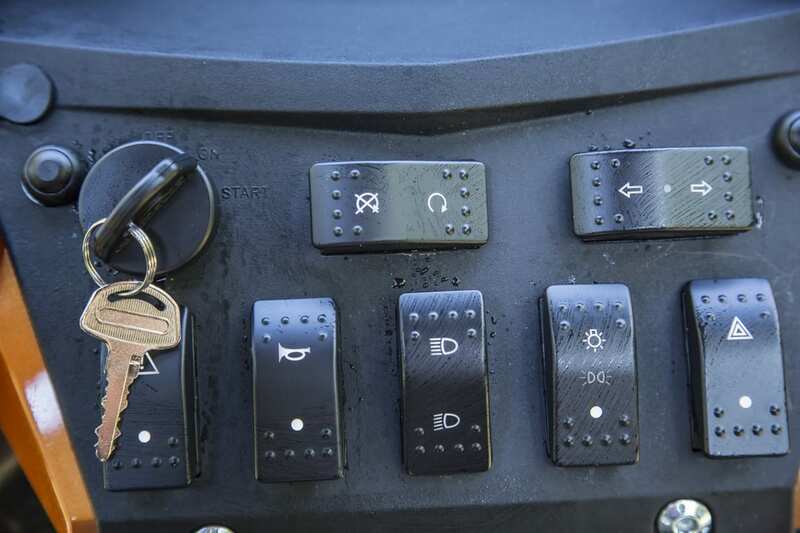 It also has a hand brake for parking. There are also turn signals, hazard lights and a horn, which come in handier than we thought they would on the trail. LED headlights and tail lights are bright and a nice touch. We aren’t sure if the stainless-steel exhaust helps the performance of the machine, but it sure looks sweet and is durable to boot. The air filter is a twin-foam reusable design similar to high performance add-on systems. It was clear that a lot of thought was put into setting up the ZFORCE in a way that many users would do so with the accessory market. That fact was not lost on us when we were testing the machine. It is indicative of a serious commitment to the market. 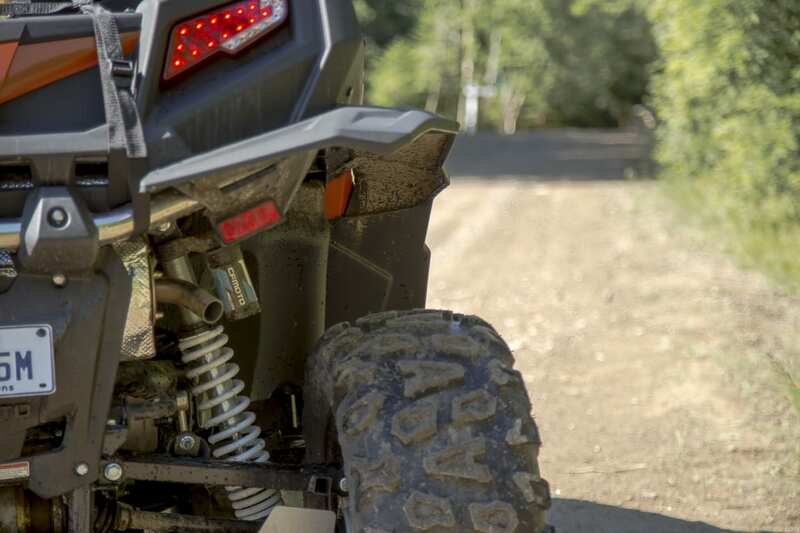 CFMOTO also makes a serious commitment to the buyer with a five-year limited warranty. 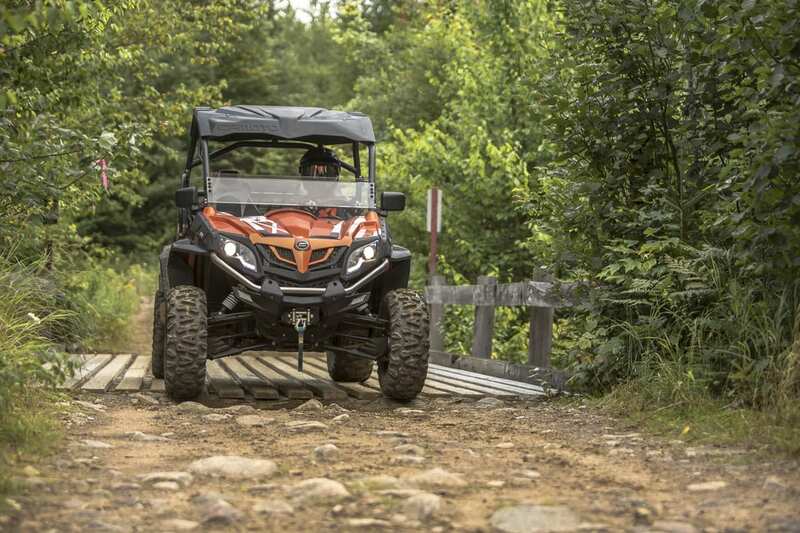 A five-year limited warranty is almost unheard of in a UTV and it makes a strong statement. So with all the major positives associated with the ZFORCE, is there anything we’d like to see changed? Sure, there are a couple of limitations the machine has that could be improved on. 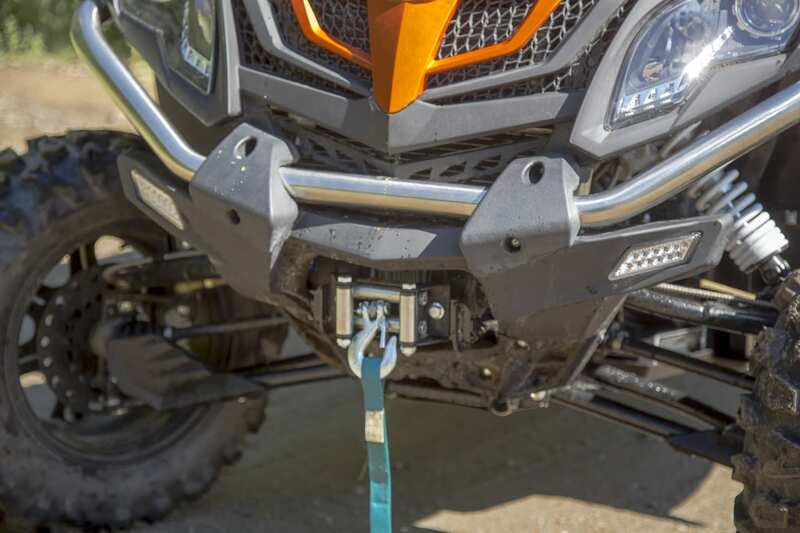 The ZFORCE comes with a 2-inch standard receiver hitch, which is a nice touch. However, the towing capacity is only 250kg. We’d expect that to be more on a machine with this kind of set up. The cargo bed area limited with only 100kg of carrying capacity. That works well for most stuff, but again, a little more would be nice for long adventures. Should you consider a CFMOTO ZFORCE 800 EX EPS for your next performance UTV? Of course, you should. 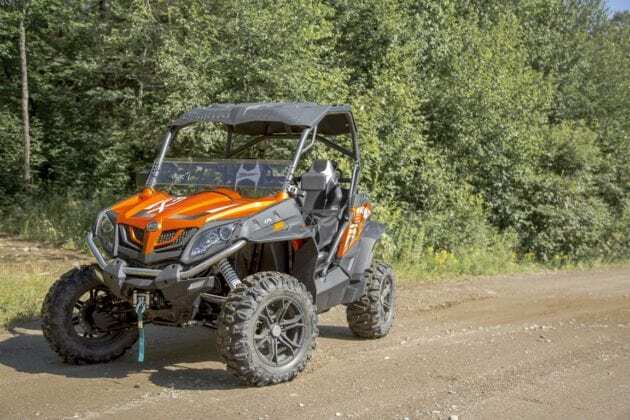 CFMOTO boasts that the machine comes with $5,450 in additional value from the added accessories they thought to bring to the market. 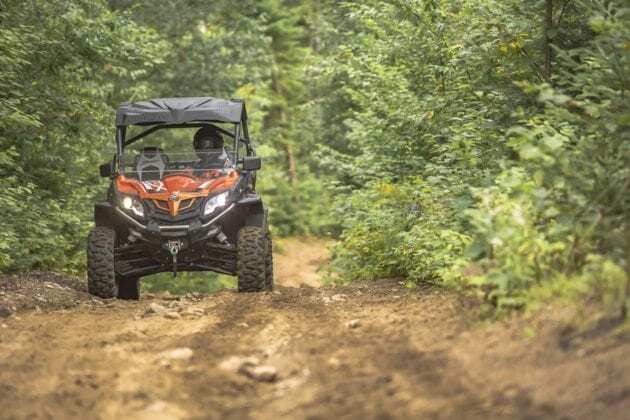 It makes the machine a great buy, and with the five-year limited warranty, it makes the ZFORCE EX a great buy and one we’ve become quite fond of.